This is an unedited version of my Sunday Times article from April 20, 2014. Quips aside, human choices and activities - the fundamental forces driving all economics - are unpredictable and painfully complex to model and measure. But beyond behavioural intricacies, complex nature of modern economic systems implies that data we use in analysis is often rendered non-representative of the realities on the ground. Take for example the concept of the national income. Economists define this as a sum of personal expenditure on consumer goods and services, net expenditure by Government on current goods and services, domestic fixed capital formation, changes in stocks and net exports of goods and services. Combined these form Gross Domestic Product or GDP. Adding Net Factor Income from the Rest of the World (profits and dividends flowing from foreign destinations into Ireland, less payments of similar outflows from Ireland) gives us Gross National Product or GNP. All of this seems rather straightforward when it comes to an average country analysis. By and large the overall changes GDP and GNP are closely linked to other economic performance indicators, such as inflation, investment, employment and household incomes. Alas, this is not the case for a tiny number of small open economies with significant share of international activities in their total output, such as Ireland. In such economies, both GDP and GNP can be severely skewed by tax optimisation and global rent-seeking strategies of multinational enterprises. Faced with large share of domestic accounts distorted by tax arbitrage, economists are left to deal with high degrees of uncertainty when forecasting national output and employment. Even past data becomes hard to interpret. In recent months, various analysts published a wide range of forecasts and predictions for Irish economy for 2014-2015. Consider just three sources of such forecasts: Department of Finance, the ESRI and the IMF. Budget 2014 projections, forming the basis of our fiscal policy predicted average annual real GDP growth of 2.15 percent, with underlying real GNP growth of 1.7 percent. These projections were based on the assumed annual growth of 1.5 percent in personal consumption, and 6.35 percent growth in investment. These projections were also in-line with IMF forecasts. Around the same time, ESRI was forecasting GDP growth of 2.6 percent for 2014 and GNP growth of 2.7 percent, well ahead of the Department of Finance outlook. ESRI forecasts were much more skewed in favour of domestic investment and personal consumption. Fast-forward six months to today. In its latest analysis, IMF lowered its forecast for our GDP growth to 1.7 percent for 2014, leaving unchanged their outlook for 2015. The Fund forecast for GNP growth remained unchanged for 2014 and was raised for 2015. ESRI has shifted decidedly into even more optimistic territory. The Institute's latest predictions are for GDP expansion of 3.05 percent on average in 2014-2015. GNP growth forecast is now at 3.6 percent. ESRI's rosy projections are based on expectations of a massive 10 percent growth in investment, with private consumption expectations also ahead of previous projections. Finally, this week, Department of Finance upgraded its own forecasts, lifting expected 2014-2015 growth to 2.4 percent for GDP and 2.5 percent for GNP. Domestic demand growth is now expected to average 2.4 percent through 2015, and investment growth is expected to run at a head-spinning rate of 13.9 percent. Everyone, save the IMF, is getting increasingly bullish on Irish domestic economy, which, in return, spells good news for employment and household finances. The problem is that all of these forecasts give little comfort to anyone seriously concerned with the impact of economic growth on the ground, in the real economy. Even the ESRI now admits that we cannot forecast this economy with any degree of precision. More significantly, the Institute recognises that our GDP figures are no longer meaningful when it comes to measuring actual economic performance. 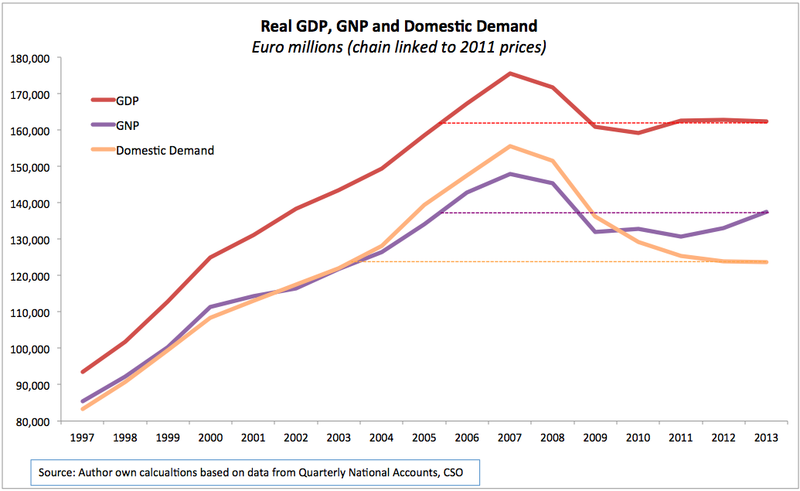 Instead, the ESRI claims that GNP is a better gauge of the real state of the Irish economy. In truth, the proverbial rabbit hole does not end there: Irish GNP itself is still heavily skewed by the very same distortions that render our GDP nearly useless. The ongoing changes in our exports and imports composition are throwing thick fog of obscurity over our net exports, which account for 22.6 percent of our GDP and 26.7 percent of our GNP – not a small share. Since 2012, expiration of international patents in the pharmaceutical sector, triggered billions in lost exports revenues and shrinking trade surplus. In colloquial terms, Irish economy is now running weak on expired Viagra. Just how much the patent cliff depresses our GDP and GNP is a mater of dispute, but we do know that pharma accounts for about one quarter of our total exports and one eighth of the gross value added in economy despite employing very few workers here. The patent cliff was responsible for a massive 1.25 percent drop in our labour productivity across the entire economy last year. But, as ESRI analysis previously shown, the overall effect of patents expirations on our GDP (and by corollary on GNP) is extremely sensitive to the assumptions relating to where pharma companies book their final profits. Profits booked in Ireland yield significant adverse impact. Profits channeled through Ireland to offshore destinations have negligible impact. Which brings us to the second force contributing to rendering both GDP and GNP growth largely irrelevant as measures of our economic wellbeing. Based on data through Q4 2013, since the bottom of the Great Recession in 2010, our net exports of goods and services rose EUR10.6 billion, driven by EUR14.4 billion in new exports of services offset by the decline of EUR3.05 billion in exports of goods. Ireland’s exports-led recovery was associated with a massive shift toward ICT exports. Much of this trade was associated with little real activity on the ground. Consider for example tax revenues. In 2010-2013, for each euro in added net exports, the Exchequer revenues increased by less than 3.3 cents. Back in 2000-2002 period the same relationship was more than six times higher. Of course back then both the MNCs and domestic companies were in rude health or on steroids of cheap credit and patents protection, depending on how a two-handed economist might look at the numbers. Still, the core composition of our exports was more directly connected to real production and value creation taking place in this country. This can be directly witnessed by looking at other metrics of current activity, such as Purchasing Manager Indices published by Markit and Investec Ireland. Since Q1 2010, both Services and Manufacturing PMIs have been consistently signaling a booming economy. Meanwhile, GDP posted an average annual rate of growth of just 0.22 percent. Employment in industry ex-construction is down 21 percent on pre-crisis peak, employment in professional, scientific and technical activities is down 4.3 percent and employment in information and communication sector is down 1.1 percent. The new crop of multinational corporations driving growth of GDP and GNP in Ireland is much more aggressive at tax optimisation than their predecessors. Which means that they also tend to use fewer domestic resources to deliver real value added on the ground. All of which suggests that gauging true extent of economic growth in Ireland is no longer a simple matter of looking at either GDP or GNP figures. Instead, we are left with other aggregate measures of the real economy, such as: non-agricultural employment and the final domestic demand – a sum of private and public consumption and gross fixed capital formation. By the latter metric, this economy has managed to deliver 6 consecutive years of uninterrupted annual declines in activity. In 2013, inflation-adjusted domestic demand fell by some EUR366 million on previous year. Cumulated losses since 2008 now stand at EUR32 billion or almost 20 percent of our GDP. Good news is that the rate of declines has been de-accelerating every year since 2009. And in H2 2013 demand rose 1.75 percent year on year. Bad news is that in real terms, our final domestic demand is currently running at the levels just above those recorded in 2003. In other words, we are now into the eleventh year of the ‘lost decade’. At H2 2013 rate of growth, it will take Ireland until 2026-2027 to regain pre-crisis levels of domestic economic activity. Meanwhile, employment figures are painting a slightly more optimistic picture, albeit these figures too are not free of methodological problems. In Q4 2013, non-agricultural employment in Ireland stood at 1,793,000, with H2 figures on average up 1.91 percent or 33,550 on the same period of 2012. To-date, non-agricultural employment numbers are down 13 percent or 266,550 on pre-crisis levels. However, when one considers total population changes in Ireland since the onset of the crisis, the ratio of non-agricultural employment to total population is currently at 39 percent, which is the level below those recorded in Q4 2000. To the chagrin of the Irish policymakers and general public, our economy is, like an average economist, two-handed. On the one hand, our employment and total demand figures show an economy anemically bouncing close to the bottom. On the other hand, a handful of MNCs are pushing our GDP and GNP stats up with profits from their operations in far flung places retired here. Harry Truman really had it easy compared to Enda Kenny. The latest data from the Central Bank covering retail interest rates confirms two key trends previously highlighted in this column. The first one is the rising cost of borrowing compared to the underlying European Central Bank policy rate. In January-February 2014, average retail rates on new loans for house purchases were priced 3.32 percent higher than the ECB rate. A year ago the same margin was 2.89 percent. For non-financial corporations, average margin rose from 4.58 percent to 5.03 percent for loans under EUR1 million, and from 2.42 percent to 3.1 percent for new loans over EUR1 million. Lending margins over the ECB rate in January-February 2014, averaged two to three times the margins charged in the same period of 2007 at the peak of credit bubble. The second trend relates to the spread between rates paid by the banks on deposits and interest charged on loans. Since October 2011, Irish households consistently faced deposit rates that are by some 2 percentage points lower than the average annual cost of new loans for house purchases. In January-February 2014 this gap widened by some 0.27 percent compared to the same period of 2013. The spread is now running at double the rate recorded at the peak of the pre-crisis credit boom. The same holds for interest rates differential between loans and deposits for non-financial corporations which is now at the second largest levels since January 2003 when the data reporting started. In short, credit today is historically more expensive, while deposits are cheaper. Irish banking sector continues to extract emergency rents out of the real economy with no easing in sight.